First real tow with the new truck! 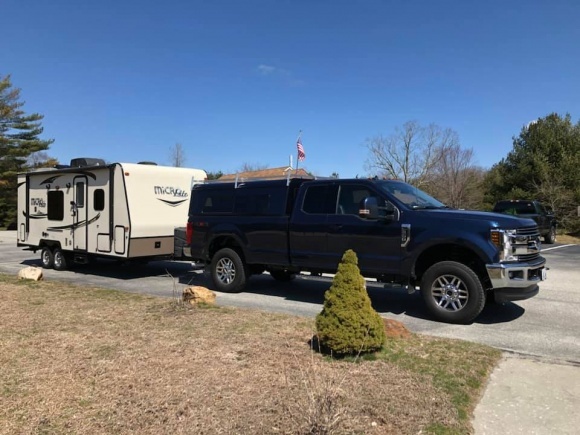 Not that I am towing that much weight (maybe 5000lbs) but it was a quick little one night getaway before the official camping season starts up here in New England. Towed without WDH to the campground and then with on the way home. I honestly couldn’t tell the difference but wanted to see if I could! Used tow haul mode but did not lock out any gears as the trailer is so light, cruised easily at 65mph in 6th gear @ 1750rpm. Highest the motor tacked up was 3250 rpm in 4th gear climbing a 4% grade (love all the gauges & readouts in this truck!) and it held 65mph easily, actually got away from me at one point and quickly noticed I was doing almost 80 up hill. So far so good, made one slight modification to my hitch setup when we got home but we are ready to start the regular camping season! Nice. These new Superduties are pretty awesome, aren't they? I have a wee bit bigger camper, so I got the diesel, but still, love these trucks.